I don’t know about you, but I always spend too much money on craft supplies. I love browsing the shelves of my local craft store looking for the next best thing…however, I don’t always have a ton of money to actually spend on supplies…which is why I LOVE felt! 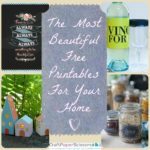 Priced at no more than $1.00 per sheet, sometimes WAY cheaper, felt offers a great solution to creating adorable crafts for pennies on the dollar. 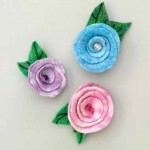 You can sew it, glue it, and even use it to create adorable hair accessories. Versatile and available in tons of colors and styles, felt is a great go-to supply if you’re feeling a crafty urge. 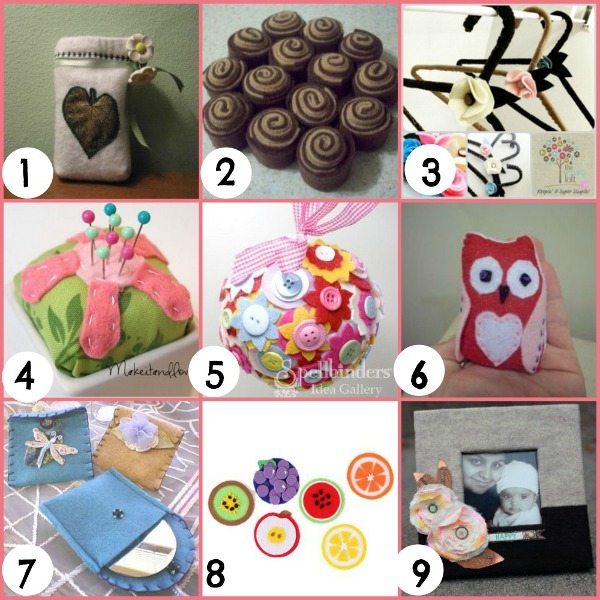 And, lucky for you, I’ve already gathered up 9 of our favorite felt projects! 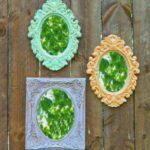 From the fun to the useful, these projects are all made with colorful sheets of felt, making them budget friendly projects, as well. These sweet Fancy Felt Pouches, for example, are great for gift wrapping. Use them to hold a mix CD, a small piece of jewelry, or a handful of homemade snacks. BONUS! 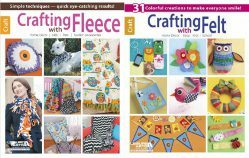 We’re giving away 2 awesome books, Crafting with Felt and Crafting with Fleece. 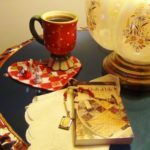 Both filled with simple and easy projects, these books are great go-to tools for quick and easy projects that anyone can make. You have until October 17th to enter this contest, and you can enter to win once a day…so the more you return, the greater your chances of winning this awesome giveaway! Head on over to the giveaway page now and enter to win today! Good luck! 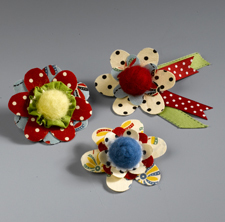 Felt is one of the most popular craft materials out there and it’s easy to see why. First of all, it’s easy to use – everyone from little kids to older adults can work with it. 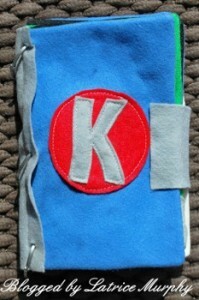 Also, you can use felt to make almost anything (we’re talking jewelry, coffee cozies and pizza, just to name a few). 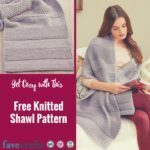 Most importantly, you don’t have to search high and low for felt – there’s always a huge variety at craft and home good stores. Since felt is basically the best craft supply on the planet (this has not been tested, but just trust us), it only made sense that we’d create a brand new free eBook that features amazing and fun felt crafts. 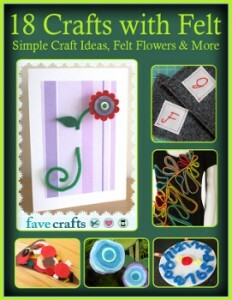 In 18 Crafts with Felt: Craft Ideas, Felt Flowers and More, you’ll find age-appropriate projects for kids, pretty flowers and so much more. Basically, there’s something for everyone. You can even gather up the family and make a few of these crafts together – it’s a great way to bond. 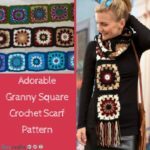 The simple projects in this eBook don’t require a ton of time or materials, so you can make a bunch in a short period of time. 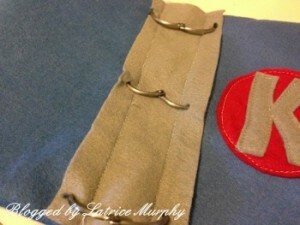 Also, not all of the projects require access to a sewing machine – all you need is some glue. 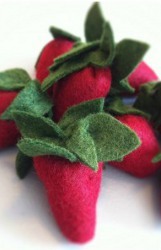 Felt Strawberries – Strawberries are a delicious treat but there’s just one problem – they don’t last forever. In fact, strawberries can often go bad in a matter of days. If you love the look of bright red strawberries, use felt to create some that won’t go bag, Place them in a bowl or basket and display them all year long for a fun, summery touch. The vibrant colors and simple design will leave you wanting more! 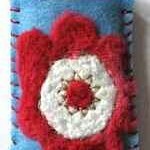 Felt Flower Needlecase – Love to sew or know someone who can’t live without their needle and thread? Create one of these cases to aid organization. The green felt is vibrant enough to capture your attention when you’re searching for supplies amid a sea of fabric and materials. 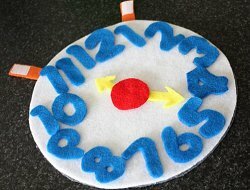 Felt Learning Clock – Learning should be fun and nothing is more fun than crafting! 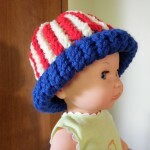 Gather up the kids and have them help with this simple project. Once completed, this clock can serve an an important education tool that is also fun to play with. 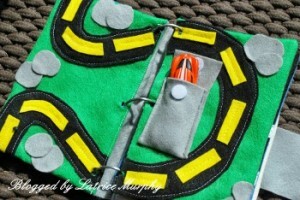 Use a sewing machine or a hot glue gun to construct this project – it’s up to you! Felt is so versatile and fun – you’ll want to use it for every single project. Get inspired and channel your creativity with 18 Crafts with Felt: Craft Ideas, Felt Flowers and More. 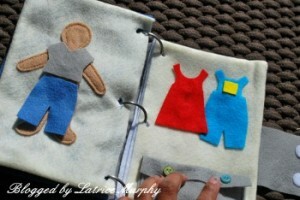 You’ll be amazed by the cool crafts you can create with felt scraps! Who doesn’t love reusable shopping bags? I know I do! Even better when I can decorate them however I please! If you’re a fellow “bag lady”, you’ll love this Feltables Fashion Flat Bottom Tote Giveaway, new from FaveCrafts! This large and sturdy tote is perfect for carrying groceries, crafts, books, and more. It’s made from cashmere-touch felt, so it’s super soft and comfortable to hold. 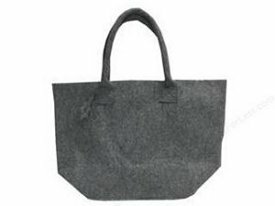 Made from 100 percent consumer recycled fibers, this Feltables Fashion Flat Bottom Tote is earth friendly in every way. Not only is it great for shopping trips, but the material used to make it is all recycled plastic bottles. Who would have thought that plastic could be so fun and fashionable? And as you can see, this bag is just begging to be decorated…which is why we were sure to include a bunch of fabric and felt embellishments in this giveaway…so you can decorate your tote however you’d like! With flowers and iron on’s of all shapes and sizes, you can turn this bag into something really special. And since the bag is made of felt, you can also create fun stitches and designs with embroidery thread and beads. The possibilities are truly endless! If you want this hip and fun bag, be sure to visit the Feltables Fashion Felt Bottom Tote Giveaway page before March 23rd and sign up to win! You can enter once daily, so return often to improve your chances of winning! 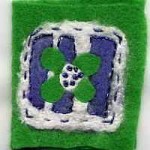 There are a lot of different ways of working with felt. 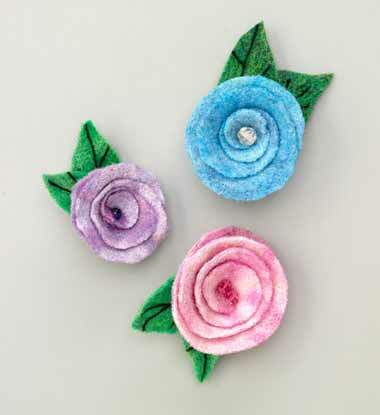 The simplest way is to buy felt pre-made from the store and use it as fabric for sewing projects, such as this Felt Carnation Pin. 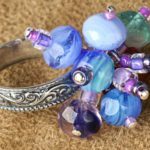 You can also make your own felt from wool roving by doing a process called “wet felting.” This method is explained further in this beautiful Wet Felted Ball Jewelry tutorial and our How to Make Felt guide. Another way to make felt is by washing and drying an old sweater–the heat will fuse the fibers together to make felt! Read all about Felting Wool Sweaters if you’re into upcycling projects! 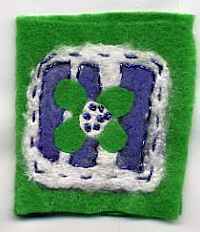 You can even make 3-D needle felted projects by shaping the wool into whatever you want to make, or attaching felt to a foam base. This Needle Felted Chick would make a great wedding cake topper, and these Flower Pins are a cute way to dress up a plain outfit. The needles used in needle felting are really sharp! Consider protecting your fingers so you don’t poke yourself. If you’re felting in the dryer, you should put your fabric in a mesh bag to avoid a clogged, fiber-filled washer and dryer. Also empty your lint catcher frequently. Try adding a pair of jeans to the load to “agitate” your felt more and get a better result. 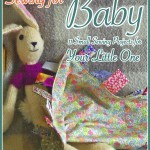 Designer Chery Ball of Stillcraftyafter50.blogspot.com sent us a great autumnal sewing project. 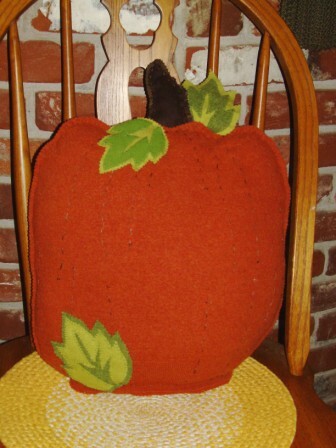 The Pumpkin Pillow is made from a felted wool sweater and scrap fabric (for the leaves and stem). A touch of embroidery adds wonderful texture to the stuffed pumpkin. The leaves are affixed easily with Aleene’s Fabric Fusion™ Adhesive. Make this now for autumn decorating or bring as a host gift to Thanksgiving dinner. The fall brings me thoughts of sweaters, cooler days, and rich and warm textures. Felt is one of those great textures that never frays and has a whole host of project that you can create. Today we are going to focus on All Kinds on Felt Critters. 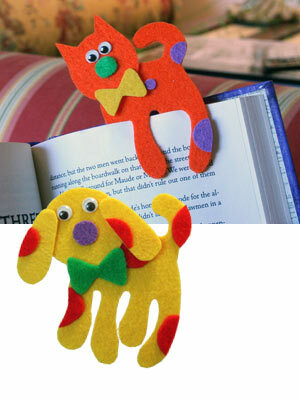 From bookmarks to finger puppets. So, gather some felt squares, pom pom, wiggle eyes, Glue Dots, ribbon, pipe cleaners, Fabri-Tac and the kids to make some very cute and easy projects! Don’t stop there! When Creativity Knocks episode this week: SQUID RO. 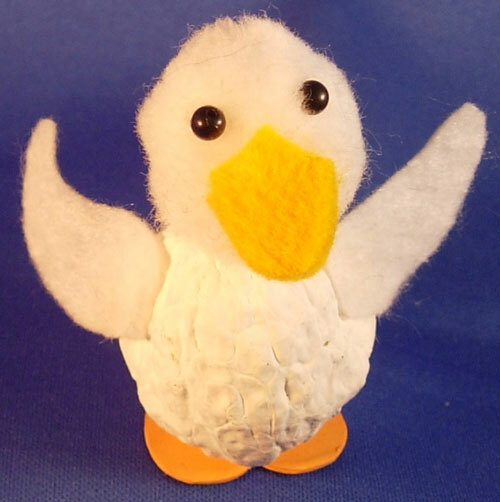 is a finger puppet that is made from “felt”. What is SQUID RO. you ask? It is the brain child from Claire Chambers who creates in the land of the small: Chickenpants Absolutely Small. Claire joined Megan and myself to share how to make this fun and crazy finger puppet in front of “WCK’s Craft Studio on Wheels” at the Makers Faire 2009. I have five nieces and two nephews. Some of you may already know that, but I love them so much. Only four of them live in the same state as me…actually, right down the street from me, while the other three live in Minnesota. Any way, whenever they come to the house I always want to do something fun with them. All the coloring and all the making jewelry is getting a little old, they’re getting bored with it. So I ran into this really cute walnut animal craft. 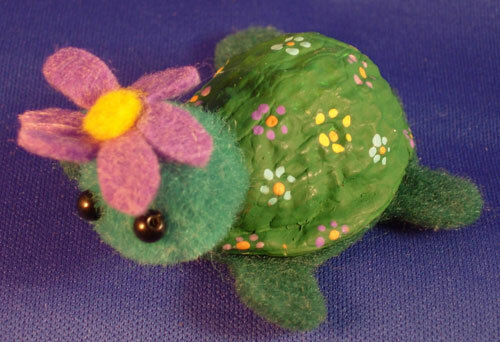 You use the shell of a Walnut along with some paints, felt and a few other materials. I really think if I work on this with the kids they’ll really love it. Of course, everyone has to make their own because why would they share? I thought I’d share these with you. I mean really, how cute are they? 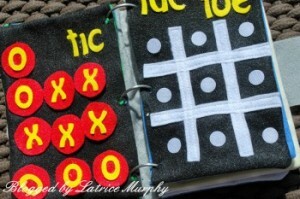 If you have any cute projects like this that you want to share please feel free to share them with me, I might use it with my nieces and nephews. 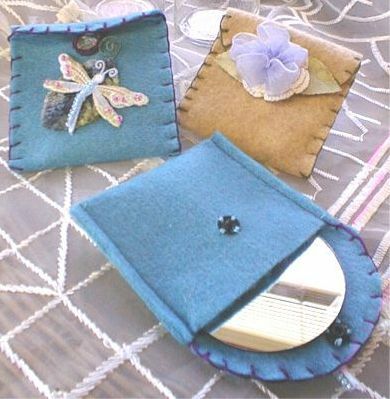 Fanciful Felt Pouches– Sew a functional felt pouch to store a small mirror, spare change or a notepad in your purse. 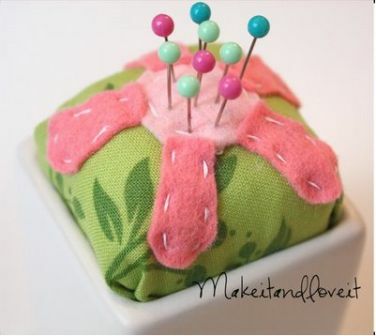 Felt Flower Pin Cushion– The felt flower keeps the pin-cushion from tearing and is a pretty embellishment. 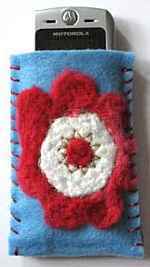 Felted Cell Phone Case– I love the pretty flower on this cell phone case. 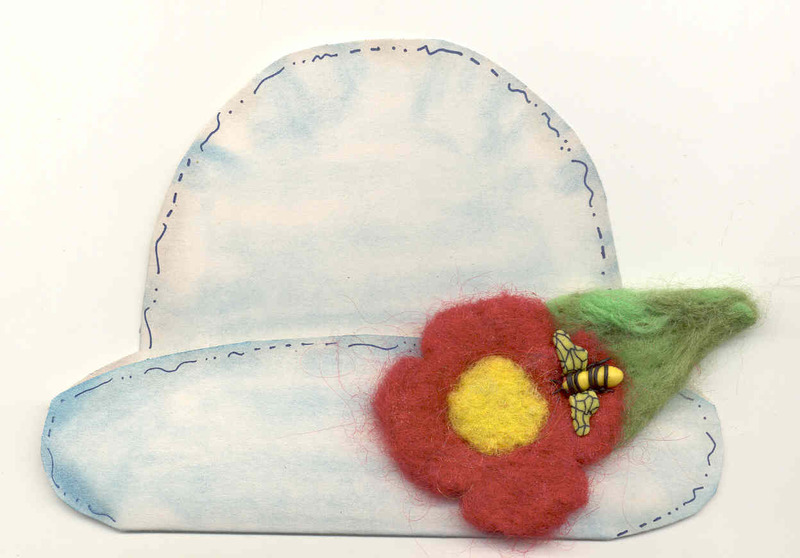 Bee in My Bonnet Card– The felt accents on this card are perfect for spring greetings.